The sun glinting off the clouds drew me outside this morning. I think I’ll use this photo as a desktop background for a while. Just breathe in the cool morning air! 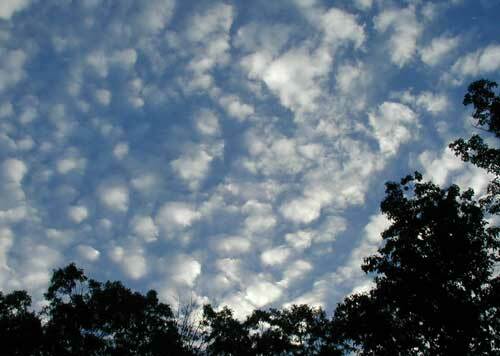 Beautiful morning sky in the mountains of southcentral Pennsylvania. I can’t seem to catch this garden spider on the other side of her net. I’m sure many people kill this lovely Argiope spider because of its scary size, but I’ll leave her to catch lots of other visitors that we don’t want chewing on the plants or buzzing around our heads. 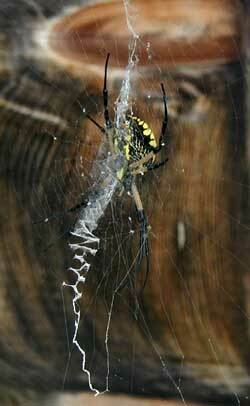 The yellow and black orb spider tends her web. The giant blue hyssop is doing well, even though it was squeezed into the garden. There must be a dozen flowering tops now. Giant blue hyssop flowering tops. The catnip at the end of the flagstone walkway is flowering nicely. It draws the honeybees and bumblebees, and the cats! Terminal flowers of catnip are blooming. 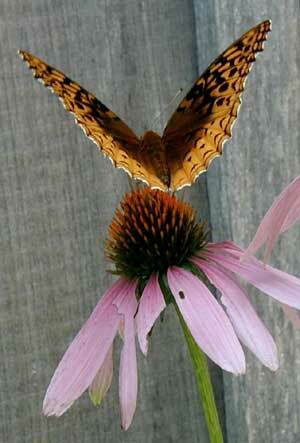 The purple cone flowers are fading quickly. The color is draining from the flower petals and grasshoppers and such are nibbling on the petals and leaves. 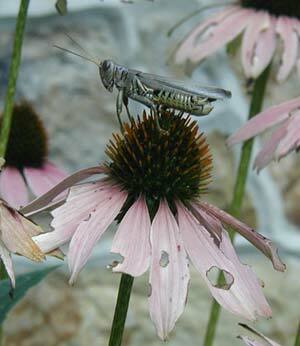 Grasshopper shopping for a little lunch among the purple cone flowers. Faded purple cone flower is now a light pink. The cone flower stems are still erect because we used a small tomato cage to contain them. 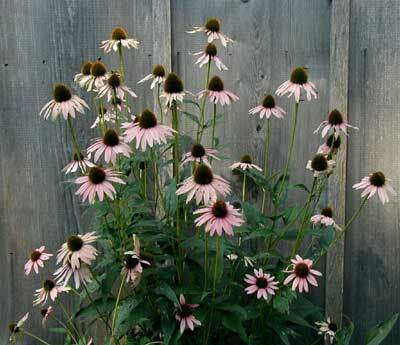 In Spring before the Echinacea put out a lot of growth, we put a cage over this cone flower plant. As the plant grew the stems were guided inside the cage and pretty soon the leaves covered the cage to hide it from view. The cage supported the stems as they gained height and really showed the coneflowers at their best. 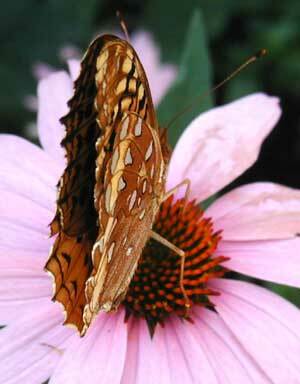 We’ll leave the seed heads on the purple cone flowers over the winter. It seems to be a favorite stopping place for the goldfinches. I had been wanting to try out some new herbs this summer, so I planted quite a number of them in flats with some great potting soil. Being surrounded by trees the sun that we do have tends to move around a lot from the morning to the afternoon. I kept moving the flats so they would feel the heat of the sun. Perhaps the shifting of the soil in the tray was not appreciated as only a couple seeds sprouted. Perhaps I purchased a bunch of crappy seeds. Anyway, having waited three weeks time, I figured no other seeds were going to sprout so I dumped the flats into the vegetable garden between a couple rows of Walla Walla onions. 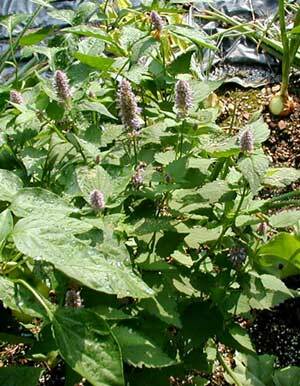 Two plants emerged from this planting disaster — sorrel and giant blue hyssop. Sorrel, Rumex acetosa, actually belongs in the vegetable garden. 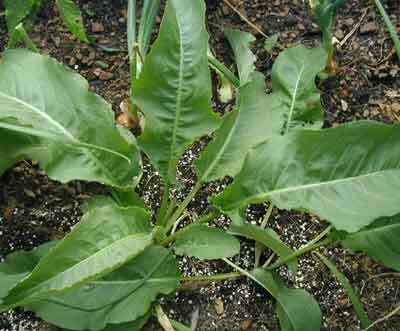 Its leaves attain great size and serve as a nice addition to garden salads. The great oval shaped leaves are a foot long or longer and at least a few inches wide. One leaf is quite enough to add some zest to a lettuce salad or to place on a couple sandwiches. Sorrel leaves ready to pick for a salad. 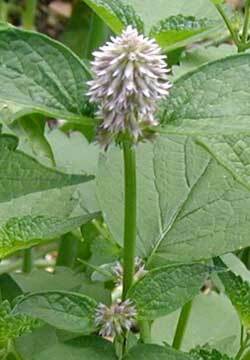 Giant Blue Hyssop, Agastache foeniculum, is also called anise hyssop because of the anise flavor of its leaves and flowers. I enjoyed adding a couple blossoms to a tomato and cucumber vinegar salad. Young anise hyssop just starting to flower. Flowering top of giant blue hyssop. 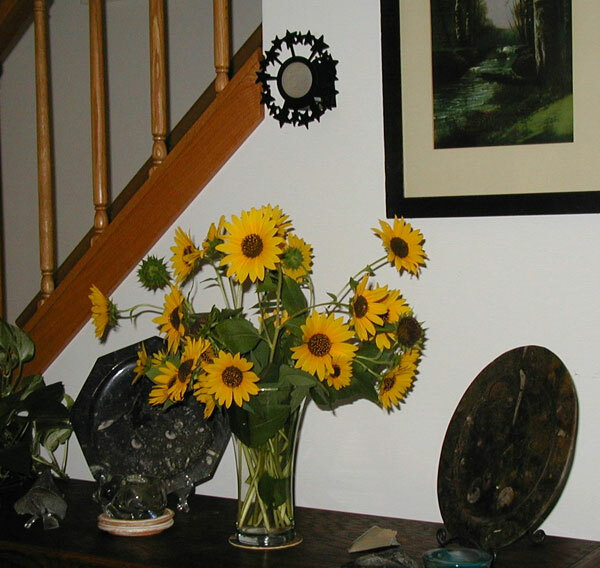 Here’s a beautiful bouquet of sunflowers that we brought in from out back. May your day be as sunny! Beautiful stevia. Nary a leaf on the Sweet Leaf plant is touched by munching insects. Stevia or sweet leaf plant with leaves intact. 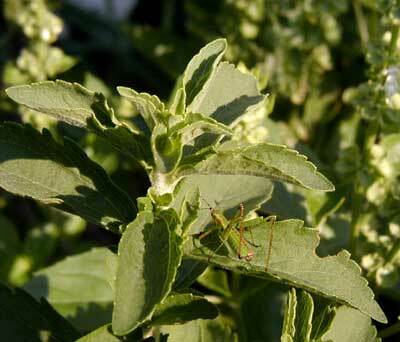 Predatory insects may lie and wait among the symmetrical leaves of Stevia. Ambush predators, that’s what they are! 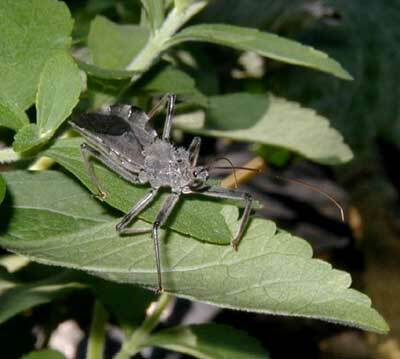 Wheel bug waits on stevia leaf for an unsuspecting passerby. 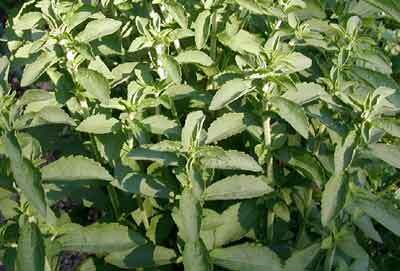 Stevia is not completely resistant to pests, but not many pests appreciate Stevia’s extremely sweet taste. Young grasshopper on stevia leaf. Inspecting the vegetable and herb gardens this morning I came across this still bumblebee. He was hanging on to the underside of a leaf from the pepper plant, near the basil he must have supped from the previous day. Those tiny little crampons on his feet just held him in place, all night? The warmth of the morning sun had not yet shone on his boudoir, so he must have been still sleeping! 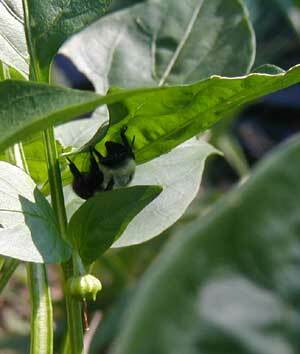 Sleeping bumblebee under a pepper leaf. The season is about done for the Japanese beetles. They have been terrorizing my peach trees, ornamental maple tree, sassafras trees, and dahlias, too. This morning I captured quit a few from the basil flowers. In they went into a jar of soapy water. Held the jar below the branch and knocked them off. Sometimes they flew away, but the majority was captured. 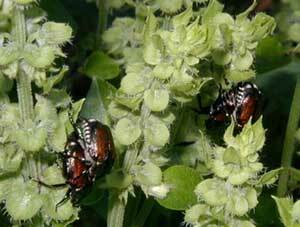 Japanese beetles on basil flowers. A family of phoebes has been helping me combat the hordes of flying beetles and bugs this summer. Their nest was built atop a lamp that is attached to the house near a garage doorway. They have a habit of sitting at one spot on a branch or post, flying off to catch an insect in mid-air, and then flying back to the same spot on the same branch. Maybe they choose branches with a great view of the insect action, or maybe just high enough to keep the cats in site? Another pest that we don’t mind seeing around here is the braconid wasp that takes care of a nasty garden pest. Tomato Hornworms are really bad for the tomato eater. These caterpillars grow very quickly and can decimate a tomato or pepper plant very fast! Not only do they eat the leaves, I am mean the entire leaf, they eat the fruits. Your tomato plants will look like sticks if these nasty hornworms are not taken care of. Nature comes to the rescue in the lifecycle of the Braconid wasps. Females lay their eggs in the tomato hornworm caterpillar from which they take nourishment. The hornworm stops feeding and soon dries up to a little black reminant of itself. Wasp silk cocoons laid in tomato horn worm on a tomato plant. To combat the hornworms we pick off any caterpillars that do not have wasp parasites. The caterpillars that are infested with the wasps are left alone to encourage the growth of more wasps. This tactic should help to shift the balance of power to the wasps. Wandering around the mountain top didn’t take me very far today. Here’s a few snaps of some flowering herbs. These herbs are growing in a protected area next to the house that gets morning and early afternoon sun. Basil is one of my favorite herbs. The aroma of a crushed basil leaf awakens the senses. Basil can dress up any regular garden salad and goes exceptionally well with tomatoes. 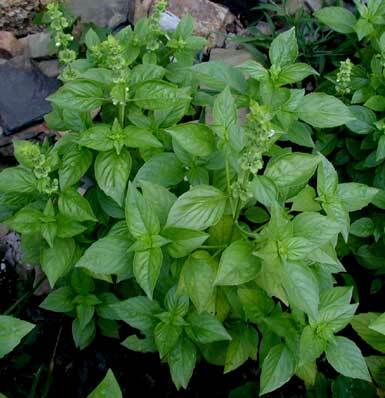 Basil has relatively large leaves for an herb, measuring 2 or more inches in length and an inch or so in width. 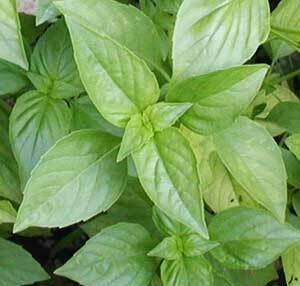 The light green basil leaves feel very pliable and smooth and are arranged opposite one another going up the stem. Light green opposite leaves of basil. Flowering tops of basil are easily recognized as they appear like groups of little circular canopies with small white blossoms hanging underneath each awning. Circlets of basil blooms are separated by half and inch or more and there will be 10-12 groups of blooms on the terminal portion of the basil stem. Below you can see half a dozen basil flower spikes. Terminal flower spikes in basil. The oregano is flowering now and has tiny white blossoms. The leaves next to the flowering tops are tiny compared to the typical leaves, perhaps a tenth the size. Below the flowering oregano tops are seen in the foreground and regular oregano leaves in the background. Flowering tops of oregano with very tiny white blossoms and tiny leaves. Catnip grows wild here in southcentral Pennsylvania and we make sure to spread a few seeds around to please the kitties. I like cats a lot more than I like mice and other rodents! 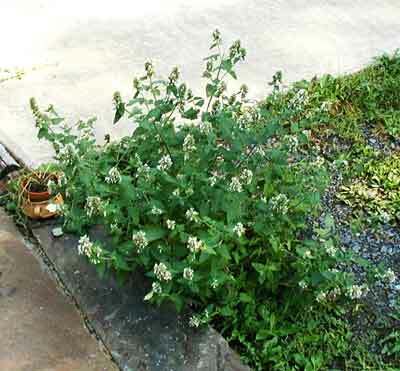 The catnip plant here volunteered next to the flagstone walkway just outside the garage. Whenever leaving or entering the garage the scent of catnip fills the air as the car brushes past. 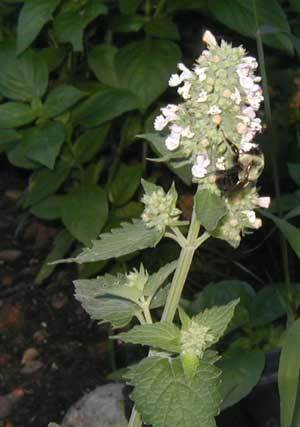 Here, we see a bumblebee pollinating the small white catnip flowers. Bumblebee pollinating the catnip blossoms. 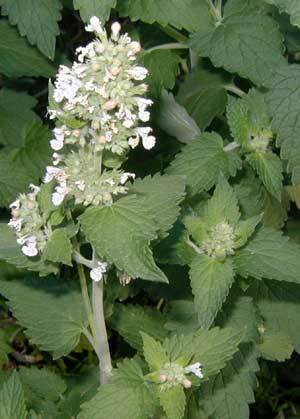 Catnip, Nepeta cataria, is a member of the mint family having opposite leaves that are somewhat arrow shaped. The main stem in the image below was snipped to induce bushiness and indeed, new stems arose from the leaf axils. The new stems now have terminal flower clusters with many small white-to-pinkish flowers. Pruning the tops of catnip stems will produce a bushier plant. 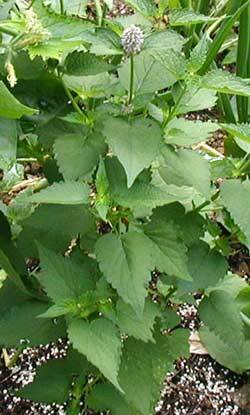 Catnip leaves feel somewhat soft and have a distinct shape. At the base the leaves are squared off, have a jagged appearance, and attach to the main stem with their own short stem. The best indicator that you have found catnip is to crush a leaf and smell the minty aroma. Rub a leaf on your pants or sleeves to act as a bug repellent. 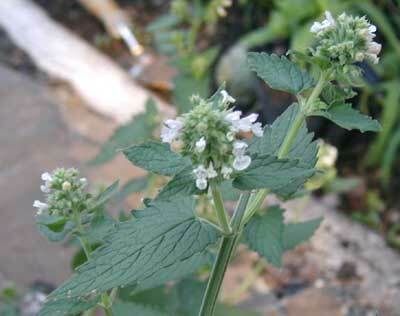 Scientists are studying a compound found in catnip, called nepetalactone, for its pest resisting properties. Most catnip leaves are left untouched by chewing insects. Pinkish to white blossoms of catnip are packed together at the top of stems. The one wild flower I did capture today was the Asiatic Dayflower, Commelina communis, an alien that appears in wasteplaces and along roadsides or other disturbed areas. We have a few batches growing at the edge of woods and along the lane. 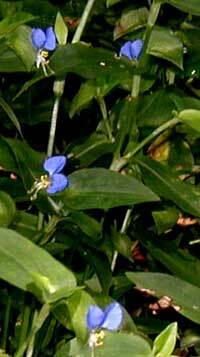 A member of the spiderwort family the Dayflower has radially symmetrical flowers having three petals, two blue petals on top and a third petal below that is white. The simple leaves are alternate and wrap around the stem at the leaf base giving it a sheath-like appearance. Asiatic Dayflowers last for only one day! Since I spend a bit of my time appreciating wild flowers and garden flowers, it makes sense that I would notice a lot of butterflies and other pollinators. 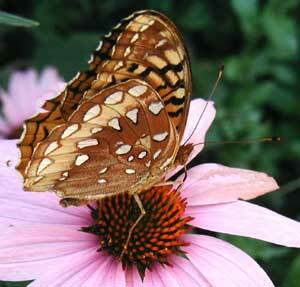 Many of us design gardens or flower beds with the intention of attracting butterflies and hummingbirds. The Image Gallery of Butterflies and Moths of North America is a great resource for identification help. 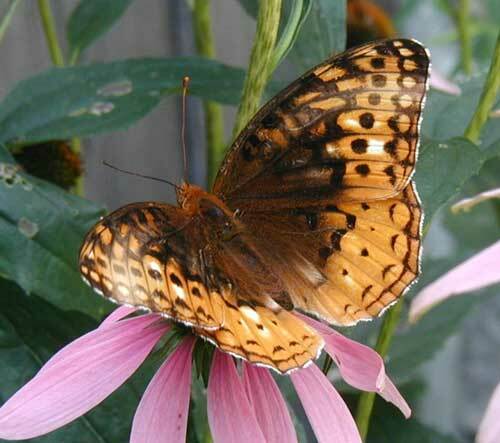 A common butterfly for us here in south central Pennsylvania is the Great Spangled Fritillary. Here, one butterfly poses rather bat-like. The inside butterfly wing patterns usually differ from the outer wing designs. This butterfly might be missed when you look at it on edge. Typically, we don’t see this view of a butterfly. Butterfly from the rear view. 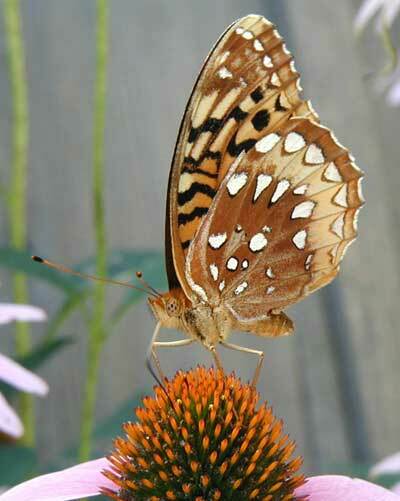 Side view of the great spangled fritillary butterfly. 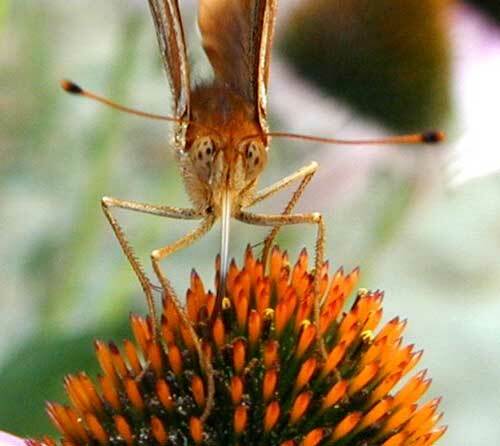 Side of the fritillary butterfly. 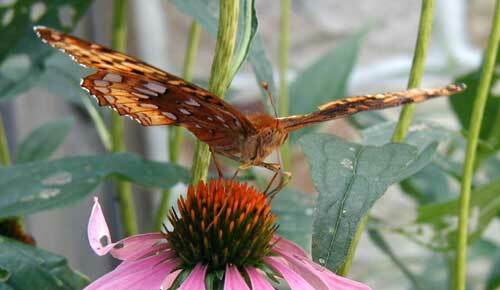 Frontal view of the great spangled fritillary butterfly. Great Spangled Fritillary Butterfly head shot. Check out those eyes! Great Spangled Fritillary Butterfly Head Shot. In case you’re butterflied out, here’s a double tiger lily with a visitor lurking in the shadows. 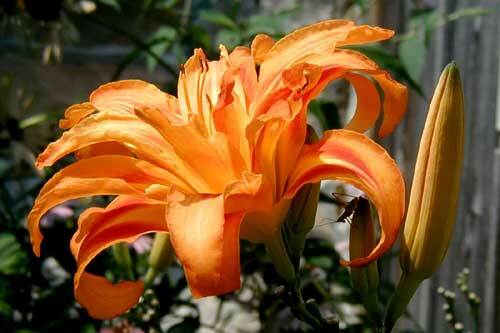 Beautiful orange double tiger lily.